For the longest time my animal allergies seemed inconsistent. I seemed to be okay with some dogs, but not others, some cats, not others, some horses, some chickens, some hamsters… the conflicting pet list went on and on. Being an animal lover, I wanted to make sense of it all. I should start off by saying that I grew up with lots of pets in my household, and all my friends seemed to have a plethora of pets as well. We had neighbors with bunnies, so we inevitably ended up with somehow only two of those- Carrot and Lazy. At different times, but also with a lot of overlap, I had a salamander, two frogs, goldfish, two panda bear hamsters Cookie & Cream- who we were told were both Male, until Cream shockingly and semi-traumatically gave birth to Oreo and Pinky. I had a gerbil who lived a very long life, our cats Quest and Arena (I’ve always been highly allergic to cat dander, these two are still around, ages 10 and 11 & live with my mom), our dogs Emma and Tara, and later our dog Brownie after Tara passed away. And to be honest, I’m feeling like I’m forgetting some. As a kid, my family checked ingredients to be certain to not buy peanut butter dog containing treats, but that was basically the extent of our safety measures. In hindsight, the bunny, gerbil and hamster food was very risky for me in terms of exposure! It turns out I actually am slightly allergic to dogs, which I know from the blood allergy testing I got done in 2016. For a while I thought that I had a dog allergy suddenly develop, since I would break out in hives and/or get a swollen lip and face at friends’ and families’ houses from their dog’s saliva. Peanut derivatives are found frequently in dog food and treats, and peanut butter is used as a pairing for many common dog toys. The culprit of these reactions was due to peanut cross-contamination coming into play and I wasn’t realizing it. Remnants would not only be in their saliva, but also on rugs or carpets from them chewing on toys in the area, on the furniture, their bedding, their fur, etc. Generally, I assume small bits of peanut dust are throughout every dog owners home, and so I enter bravely and proceed with caution. The brand name wipes ‘Wet Wipes’ are convenient to keep on-hand, and actually contain an ingredient that breaks down nut-protein, so they are my favorite go-to for most situations and combating peanut dust in daily life. Another favorite product that I use is Nature’s Miracle brand ‘Allergen Blocker’ wipes for allergens such as cat dander, dog dander, dust mites, and other environmental allergens. These are particularly neat because you can wipe furniture, carpet, and other surfaces, but you can also wipe the animals directly to break down their allergen proteins while deodorizing their coats. I love going to friends’ and families’ homes who have animals, but it brings a whole new side of my airborne and severe allergy out that I really need to stay aware of, and honestly try to limit when possible. From dogs who play with peanut butter filled Kong toys or take daily medicine with peanut butter, to birds in cages with dusty bird feed that gets onto surfaces and microscopically into the air- the potentials are truly endless. Cross-contamination from pets is a very common problem I run into with my severe food allergy. 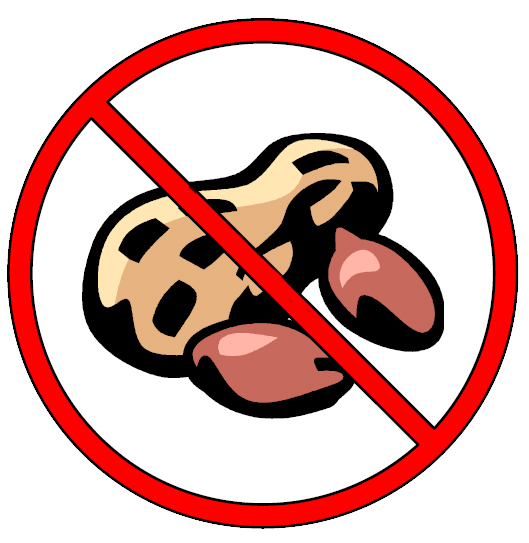 For people new to food allergies, or those not well-versed in food allergies, it’s something that is often not considered, since there’s no real act of eating that is involved. After determining why I was reacting to others pets, I immediately wanted my own safe pup in my life. I knew I could keep my own dog peanut-free for myself! My husband and I got a beagle mix named Colby as a 5 ½ year old rescue from a local shelter. Colby eats Earthborn brand food, which luckily he seems to like, because he is picky! Earthborn is also a company I feel good supporting for environmental reasons, it is the only brand I found that is a peanut free-facility as far as dog food manufacturing goes, with ingredients that are recognizable. Unfortunately, their treats are not safe. The brand Fromm makes safe treats, but they can be expensive! We got those for a long time and still do occasionally, but now we make our own a lot of the time out of Bob’s Red Mill brown rice flour and other dog-friendly and Zoë-safe ingredients! They make great gifts as well to other pet parents, and can be customized with cookie cutters to adorable shapes and varying sizes. Luckily some pet brands were responsive and helpful to my inquiries. As a general rule, if I don’t get a reply back from a company, or if I get a vague reply, I cross it off my potential brand list and move on to the next. It is hard enough finding out about dog food, but I also needed to know about pet wipes and washes, and pet treats as many facilities use undeclared ingredients, shared equipment with peanuts, and also legally these companies don’t have to label with a basic ‘contains’ statement, since it isn’t designed for human consumption. This will have to get covered in another post- because I could go on and on about undeclared allergens in household products! I will admit— I understand the hype surrounding giving your pet peanut butter to get them to swallow their medicine. We have a very allergic dog, funnily enough, and he takes a prescription allergy medicine daily for environmental allergens. He will spit the pill out of most things, but alternative-nut butters that are labeled and safe for me, such as soynut butter, pea butter, or cashew butter seem to work the best! Play dates with other dogs can be risky, but are fun for both dog and human parties, so during these my main objective is to try to limit my own touching of my face, especially my mouth area or eyes (a good habit anyway), since who knows where the other dogs have been, or what the other dogs have had recently. If I get a lot of licks from the other dog, I normally try to wash the area relatively quickly as a precaution! I also wash Colby afterwards, or have my husband help me wipe him down, and anything else that may be cross-contaminated by potential peanut ingredients from the other dog. I’ve recognized recently that I need to improve my conversations with friends and family who have dogs that play with Colby, to make sure they avoid giving peanut products if they can help it. Most of the time I do, and friends who I see often are mindful, but occasionally situations happen where I don’t communicate as much as I should, and then I have a lot of cleaning to do afterwards to try to secure my safety and a peanut-free house, especially if we host the playdate. This is a bit off topic, but I actually had to ask a neighbor of mine last year to stop feeding peanuts to our neighborhood squirrels. After finding peanuts in my front lawn and on my porch due to our big oak trees above, I initially thought it was the mailman (well, in actuality, I first thought I had an enemy). I called the post office and asked if my mailman may be potentially feeding the squirrels, as I’ve seen him feed cats before. Turns out, he was not, and he’s a very nice guy! Later while out walking my dog, Colby actually ATE a peanut. I was in a panic over that alone, until I realized I had also stepped on a peanut piece, which got stuck in a crevice on the bottom of my sneaker. I quickly followed the peanut trail with my eyes, mostly to escape as quickly as possible, to find my neighbor’s front yard littered with peanuts! Luckily, he was very understanding and now uses sunflower seeds. I should probably write him a thank you note again, to also serve as a friendly reminder. I didn’t want to tell him, since he was doing a nice gesture for me, but feeding squirrels peanuts is actually bad for their digestion, as they are in the legume family, and not a ‘nut’. Just a side note! It’s important for me to keep my environment safe, but I also try to not get too hung up on the potential cross-contaminated side of pets. I stay aware and alert, always, whether I like to or not, so I try to trust that I’m taking precautions to keep myself safe. Cross-contamination in general is an entire issue I will cover much more in-depth, so that may be my next blog post. It’s everywhere, at every moment, and entirely unavoidable. Touching doorknobs, going into an animal shelter, using anything public like a library book, or even a book a friend lends you, sitting on a park bench, doing simple shopping at the grocery store, arranging store bought cut flowers– all of these normal actions are just as risky as having a doggy play date. The goal is to not avoid everything, but try to take as much control over situations as you can, and then try to enjoy the moment. I’m so glad I got a dog, and didn’t let my allergy get in the way! If you or your allergic child want an animal and aren’t allergic, I say give it a shot!